Is Red Dye Harmful to Hummingbirds? 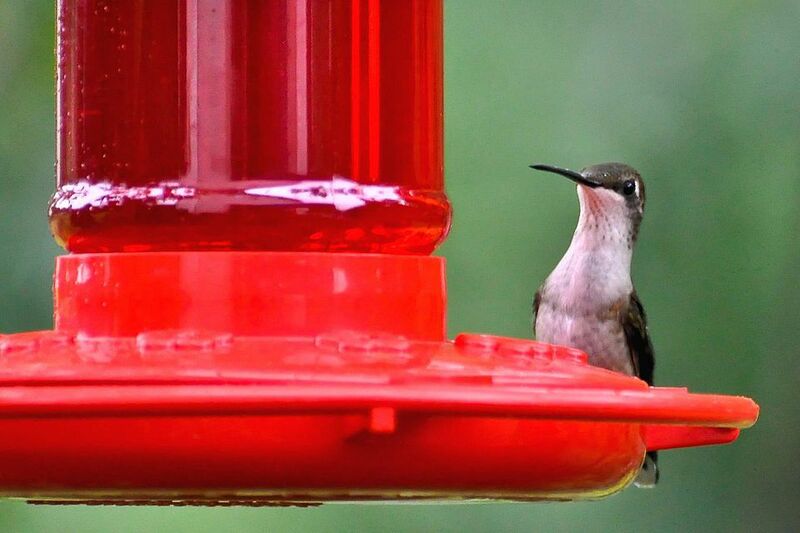 Is red dye in hummingbird nectar bad for the birds? Dyed nectar and red hummingbird food are controversial, and there are many urban legends, and inaccurate hypotheses circulating. Concerned birders should learn the truth and misconceptions about red dye to be sure they are keeping their birds safe. While red dye might not pose the dangers some worry it could, colorless nectar will provide the nutrition and sustenance needed for healthy hummingbirds. Many commercial hummingbird nectars, both powdered mixes and liquid concentrates, include red dye. Because hummingbirds are attracted to red, the dye is useful as a sales point for backyard birding consumers, and red nectar stands out on store shelves more effectively than clear bottles. However, attracting hummingbirds is simple, and there is no need for red dye in hummingbird nectar. Many hummingbird feeders have red caps, bases, or floral decorations, and that color is sufficient to attract the birds. Adding other red color sources nearby, such as nectar-bearing flowers, ribbons, a gazing ball, flower pots, patio cushions, or Christmas ornaments can give a feeding area an extra burst of color without any risk of potentially unhealthy dyes. The concern about red dye’s harmful effects on hummingbirds originated with the red dye scare in the mid-1970s. At that time, the popular Red Dye No. 2 (Amaranth) used in food, drugs, and cosmetics was linked to cancer growth in laboratory rats. The suspected carcinogen was rapidly removed from consumer products, and it was banned by the U.S. Food and Drug Administration (FDA) in 1976. Today, Red Dye No. 40 (Allura Red AC or Food Red 17) has been approved by the FDA for consumption, and the compound is used for many food, drug, tattoo ink, and cosmetic colorings. There are still some concerns, however, particularly for children with health conditions such as a predisposition to attention deficit hyperactivity disorder (ADHD). Because of those concerns and the need for ongoing study, Red Dye No. 40 has been banned in several European countries, including France, Belgium, Denmark, Switzerland, Norway, and Sweden. Bans have changed in recent years with regulations affecting the entire European Union, but reservations about the safety of the dye still remain. There have been no definitive, conclusive studies, however, that link Red Dye No. 40 to cancer or other detrimental health conditions when it is consumed in the small quantities found in many colored foods. The greatest concern about whether or not red dye is harmful to hummingbirds comes not only from the possible dangers of the chemical itself but also from how the birds consume it. Because nectar is by far the largest component of a hummingbird’s diet, a single bird’s consumption of dye through colored nectar can be extreme. No detailed studies have been done solely with hummingbirds and different red dyes or dye concentrations, however. The birds’ physiology, metabolism, and nutritional needs are sufficiently different from humans that any conclusions stating the dye is safe for human consumption may not be valid for hummingbirds. The key point in deciding whether or not red dye is harmful to hummingbirds is simple. There is no conclusive research saying the dye is dangerous to the birds, but there is also no long-term research saying it is safe. When making a decision about red dye for nectar, many birders prefer to be cautious and avoid unnecessary and potentially dangerous chemicals. Many nectar concentrate manufacturers are following suit, and today fewer companies are offering pre-made nectar with any red coloring. What About Natural Red Coloring? Instead of adding chemical dyes to nectar, it may seem better to try "natural" sources of red coloring. Backyard birders have experimented with using different juices, such as beet, cranberry, or fruit punch, to colorize nectar. While this may seem safe, if those juices are from concentrates or otherwise processed, they may already contain artificial dyes that will contaminate the nectar. Even if the juice is fresh and has no additives, however, it is not recommended to add it to hummingbird nectar. The sugars in different juices are not the same as the sucrose composition hummingbirds need, and adding juice will only dilute the proper nectar recipe and make it less useful to birds. Since the red color is not critical for attracting hummingbirds, it is best to simply avoid complicating nectar with any form of coloration.